We’ll come right out and say it: we’re full-on Porsche geeks here at HOUSE Automotive in Pasadena. What can we say? The Porsche brand represents an incredible automotive legacy, and if anything, we’re honored to work on these special machines on a daily basis. From the off-road ruggedness of the Porsche Cayenne to the pinpoint precision and mind-bending speed of the 911 Carrera Turbo, Porsche has developed an objective reputation for a driving experience specifically catered to…that’s right, the driver. At HOUSE Automotive, we leave the design and engineering work to Porsche themselves. However, we take in providing the greater Los Angeles area with reliable and fair Porsche service and Porsche maintenance. Should the unexpected happen and you find yourself searching “Porsche mechanic near me,” don’t hastily take your Porsche model to a European car repair shop. Instead, take it to the experts at HOUSE Automotive who solely focus on Porsches and nothing but Porsches. Curious about our independent Porsche services? From brake repair to oil and filter services and performance tuning, HOUSE Automotive has our fellow Porsche enthusiasts taken care of. If you have any questions, feel free to get in touch with us today. 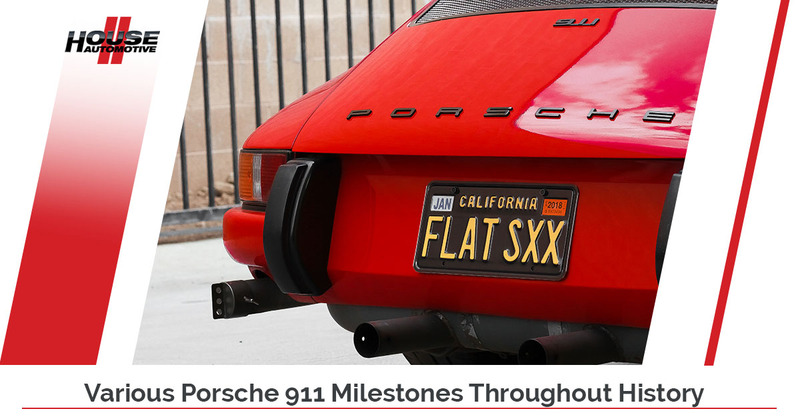 Now, as a tribute to our favorite brand, let’s take look at some significant development milestones of the iconic and timelessly-styled Porsche 911 in today’s blog post. Ah, 1963 – a year that went down in history as the first year of Porsche 911 production. Though simple rack-and-pinion steering has been an automotive standard for decades, bear in mind that this was 1963. Times were different, and this innovation in precision steering was truly groundbreaking at the time. Designed as part of the vehicle’s safety concept, the original Porsche 911 linkage had a three-part design and the steering gear was positioned in the center of the vehicle. Given this steering gear positioning, this meant that the steering wheel did not move directly toward the driver in the event of a frontal impact but, due to the angle of the steering rod, it actually moved away from the driver via the impact tubes and release elements. Introducing a new standard of steering safety technology, here’s another Porsche fun fact: Fast forwarding to 1991, Porsche was the very first car manufacturer to equip all its models with driver and front passenger airbags as standard safety equipment. When it comes to high-speed performance cars, tire manufacturer Pirelli’s motto really rings true: “Power is nothing without control.” Really, effective cooling of the brakes is important in a high-performance vehicle like the 911 in order to make sure that the vehicle can stably and repeatedly brake at high speeds. Double-walled, these brake discs allowed for optimal air circulation to reduce any heat caused by friction. Cooling was further improved on the 911 brake disc systems via a ram air duct that guided fresh air through the channels and onto the brake discs from the front through openings in the spoiler. A true testament to Porsche’s engineering brilliance, no other car manufacturer invests so much expertise into the brake systems on their series production cars as much as Porsche. As the 911 continued to develop, faster speeds called for more control and thus, better aerodynamics. Based on Porsche’s knowledge taken directly from the field of motor racing, a front spoiler was first used on the 911 S and later on the early 911 E model. The spoiler guided the air away to the side of the vehicle, thereby reducing the lift on the front section. Overall, this resulted in improved directional stability and also made the car significantly easier to handle. The 911 Carrera RS 2.7 saw the introduction of the fitted rear spoiler, featuring the distinctive “ducktail” look. Longtime Porsche enthusiasts and historians actually credit the rear spoiler on the 911 Carrera RS 2.7 as a styling feature (and practical engineering feature) that eventually rocketed the 911 into a legendary cult car. Without the concept of turbocharging an engine to spool up and create massive amounts of torque on demand, the “911 Turbo” simply wouldn’t exist. Indeed, ramping up for series production in 1974, Porsche was the first car manufacturer to successfully adapt the turbocharger to various states of driving. Interestingly enough, the engineering challenge of finding the optimum combustion of the air-fuel mixture is nearly as old as the combustion engine itself. By successfully harnessing a high operating pressure, the debut 911 Turbo really put a massive grin on people’s faces as they stomped on the gas, getting thrown back by its impressive acceleration. These days, all-wheel drive has become a drivetrain standard for countless models of vehicles. With the help of the legendary Type 959, Porsche gained extensive experience of using all-wheel drive in a sports car. However, it wasn’t until 1988 that Porsche introduced the 911 Carrera 4, their first series production all-wheel drive sports car. Featuring superior driving dynamics and then-groundbreaking technology, the Carrera 4 was able to distribute torque from the front axle to the rear axle via a planetary transfer gear. Essentially, the Carrera 4 had all the power and traction available to the driver at just about any given time. Come Down and Visit Our Pasadena Independent Porsche Service Center Today! From Porsche brake fluid service to a standard oil change and even Porsche performance exhaust tuning, HOUSE Automotive respects Porsche’s engineering legacy by taking great pride in our work. Learn more about our services or feel free to contact us about Porsche service in Pasadena today. HOUSE Automotive is wholly independent, and is not affiliated with Dr. Ing. h.c., or any of their subsidiaries, affiliates, dealers, or representatives. Porsche trademarks used within HOUSE Automotive are solely the property of Dr. Ing. h.c. F. Porsche AG.